What can I do during production to save money in post production? What can I do to prepare the audio before giving the session to you? What else is a good practice before exporting the audio OMF or AAF? Why shouldn’t I use MP3 of AAC (ITunes) files as final music sources in my project? How do I create an OMF or AAF file? What is the best way to get picture to you? What exactly makes an audio system 5.1 Surround? I’ve heard of Foley for years. What is it? The best way to both save money and get a better mix is to hire an experienced location sound recordist. The hours spent fixing and cleaning poorly recorded location audio can make up a significant portion of your audio post budget. Throw in the time spent adding sound design to support weak field audio and you begin to realize that you are paying for something that could have been captured originally by a qualified sound person. That said, we realize that many independent productions operate on a shoe- string budget and are forced to rely on friends or themselves to record production audio. Please contact us to discuss affordable solutions and strategies. I’ve locked my film in Final Cut or AVID. What can I do to prepare the audio before giving the session to you? Since the mix stage is the greatest audio post expense, you do not want the re-recording mixer cleaning up bad edits instead of mixing. When we receive your audio, the first stop will be in a lower cost Pro Tools prep room. Here our engineers will split out tracks, clean-up bad edits, do basic voluming, and add roomtones. You can save money by doing this yourself BEFORE you export your session as an OMF or AAF file. Track splitting simply means that you do not place different types of audio on the same track. For example: Voice-over should be on its own track. Background sync should not be on the same track as any FX you have put in. Music should have its own tracks and dialog as well. Roomtone refers to the sound of the room that an interview was recorded in. A good location sound recordist always records a minute of roomtone at the end of an interview. This allows the editor to fill in the gaps created by the editing of dialog. Always ingest production audio digitally. These days it is rare for location recording to be done to tape – file based audio and video are more the standard. Importing is different than capturing – but the goal is the same. Unlike the old days when editors had to record tape-based footage into their system (often through analog devices that degraded the quality), today importing is stream lined and digital. Do not delete any location audio track. If a scene was recorded to two channels in the field and the editor thinks one is completely useless, please do not get rid of it. Provide all tracks to the sound house. You’d be surprised how those “useless” tracks can become important during a mix. Do not render any audio effects that you might have experimented with during edit -- effects like equalization, reverb, noise reduction, or time stretching programs. Your edit room is not the ideal space to be making critical decisions such as these. Another important step is to make sure that your session has no mixed samples rates. The standard for film and television audio field acquisition is still 16 bit / 48 Khz. Music CDs are 16 bit / 44.1 Khz. And some DV formats support 32 Khz. 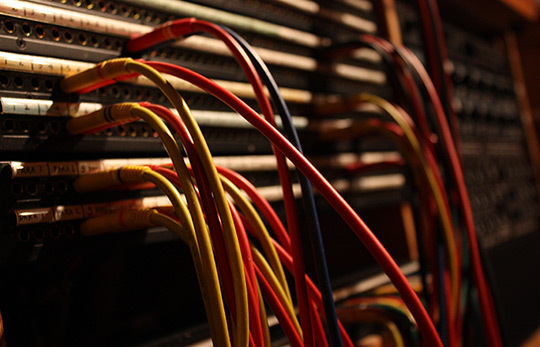 Most composers deliver 24 bit / 48 K and indeed a number of networks require 24/48 for the final mix elements. We are happy to work in any bit and sample rate that your project requires. There has been much debate about whether people can really tell the difference between a bit reduced file versus a CD. No one disputes that an MP3 is a smaller file than its CD version. But does it sacrifice quality? In my experience unless you get into MP3s that are at a higher rate (320Kbit/s instead of the more common 128Kbit/s), one can hear the difference. Of course the program material greatly determines how easy it is to detect this difference. The bottom line is that after all the “blind” listening tests, no one has argued that the CD sounds inferior to the smaller MP3 or AAC files. So spend a few extra bucks and get the music on the CD the way the artist intended it to be heard. When editing is completed it will be necessary to export your project’s audio so that we can start to work with it. Final Cut Pro makes this relatively easy. NOTE: Although FCP has newer versions, most television and film editors still use FCP 7 as its feature set is geared more to professionals. AVID created OMF. It was a straightforward way to move audio from the AVID timeline into many other manufacturers’ DAWs (Pro Tools, etc.) Although buggy in the early years, OMF has become a solid standard of the television and film communities. Quite a few years ago AVID introduced AAF. It is available on all current AVID systems while OMF is sometimes not. AAF essentially allows the editor to export the audio to Pro Tools in very much the same manner as OMF. Some of the differences are that AAF allows for the export of video as well as audio… and it exports HD MXF media. NOTE: IT IS RECCOMMENDED THAT YOU EXPORT AAFs – NOT OMFs – WHEN WORKING WITH AVID. the “Export As…” window, go into ‘Options’ to access the export settings. From the “Export As” drop down menu at the top, select AAF. You’ll want to check the “include all audio tracks in sequence” checkbox. Depending on what version of Xpress you’re on, either: Select ‘Consolidate Media’ as the export method and make sure that you select ‘Embedded’. BOTTOM LINE: AAF works quite well generally and does NOT take a huge amount of time to create (15 to 20 minutes). If you are having problems, PLEASE don't hesitate to call us for tips and advice! We still want crossfades, volumes, and 90 frame handles. Premiere doesn't like WAV files. Include panning and do not render AudioClip effects. You will most likely use 16 bit, 48K files (24 bit is fine though). Under Media, select Referenced. Media format: AIFF. Use entire file. (Premiere offers both OMF and AAF audio export. The main difference, is that you must select "Breakout to Mono" when creating an AAF.) It makes no difference to us whether you provide an OMF or AAF file. - At picture lock, remove all unused (even disabled) audio clips from the tracks and organize audio for the mixer. - With the sequence window selected, go to File > Export > OMF. - On the OMF Settings screen, choose a project title, change bit size to the appropriate value (16 or 24), files are to be embedded, and trim the audio files to 90 frames. - Select OK and type in file name for the OMF. Save to appropriate location. PLEASE CALL US AS WELL. The most common method is either a Quicktime or .mp4 movie file. Although we can handle uncompressed files, that is usually overkill. Most non-linear systems employ some amount of data compression and utilize a variety of codecs. We work with many codecs (DNxHD, ProRes, DV, H264) and can convert the file if a particular codec is problematic. We will want as close to the final visuals (graphics, animations, etc.) as possible. 720 x 480 pixels is a good starting size for us – smaller resolutions make it impossible to judge lip sync correctly. Regardless of file type and size please make sure that it is a full frame file – one that does not skip frames. Keep in mind that if you plan to upload the file through an FTP server, you might want to keep the size of the movie file under two gigs. Finally, it is always a good idea to have a head and tail “2 pop” on your project. A “2 pop” is a one frame visual cue (color bars for example) aligned with a frame of 1 KHz tone. It is placed exactly 2 seconds before first frame of picture and again 2 seconds after the last frame of picture. This simplifies syncing the final mix when re-importing into your non-linear system (especially Final Cut Pro!). Although a variety of surround systems exist today, 5.1 multi-channel surround sound is the most common. A 5.1 set-up produces five discreet channels of sound in the left, right, center, left surround and right surround positions. 5.1 systems also have one channel designated for LFE (low frequency effects) which is sent to a subwoofer. Beside the obvious creative advantages of being able to circle your viewers with dynamic sound design and music, 5.1 systems put less demand on their individual speakers. In a more conventional stereo system there are only two speakers. This means every sound, from teeth rattling explosions to dense music scores and dialog, has to “fit” into these two speakers. To achieve this, mixers have used a combination of equalization, compression, and brick wall limiting. Since 5.1 has five discreet full frequency speakers, there is less crowding which results in less distortion and a reduced need for audio processing. And the LFE (or “boom” channel) takes a huge burden off the main speakers as the LFE sub-woofer is designed to handle only the low end frequencies. Named after Hollywood legend, Jack Foley, Foley is the craft of re-creating production sound in a controlled acoustic environment. First a Foley artist assembles a wide variety of props (shoes, plates, straw, vegetables, liquids) on a soundstage that screens the film requiring Foley. The artist then literally copies the movements on the screen while being recorded by an audio engineer. Footsteps, keys jangling, drinks being poured, computer typing – whatever is required, the Foley artist must perform perfectly in sync with the production visuals. DCP, or Digital Cinema Package, is the digital version of a 35mm film print. It is what a filmmaker supplies to a commercial theater for screening on a digital projector. And like 35mm, DCP is a world wide standard. The DCP is comprised of computer files containing video and audio along with information regarding playback. It is delivered to the theater on a hard drive. There are many debates on digital versus analog 35 mm image quality, but audio is a simpler story. And the cost for DCP creation is much friendlier to the independent producer than the good old days of 35mm prints. Please call if you have questions about your audio mix and DCP - as how you approach audio post will be influenced by the decision to create a final DCP.